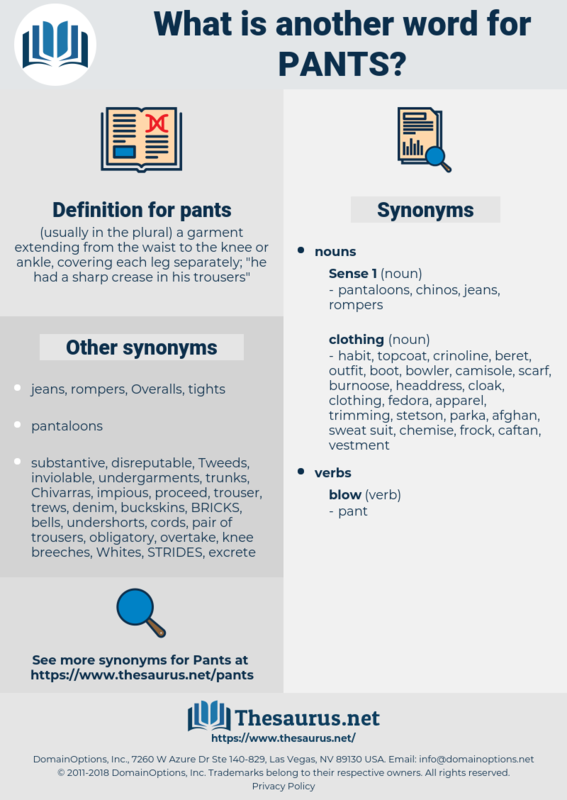 ( usually in the plural) a garment extending from the waist to the knee or ankle, covering each leg separately; " he had a sharp crease in his trousers"
straps, undergarments, vests, seatbelts, stockings, suspenders, underparts, pockets, paws, Potatoes, bags, SOCKS, tops, decreases, undersides, assholes, sideburns, sacks, thighs, knees, pouches, dicks, Overalls, declines, balls, uppers, Beds, Bas, cheeks, CLAWS, Currencies, Feet, butts, bottoms, Shots, breaches, knickers, bums, clubs, Seeds, glutes, limbs, jocks, fours, Downs, buttocks, briefs, drawers, boxers. 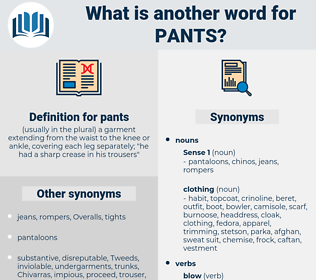 shorts, belts, breeches, britches, trousers, undies. Climbing into his jeans, Peter nearly tripped himself in his pants legs as he turned to face her. All these women he paints and pants after.